GovOnTrack is the first cloud based suite of Software As A Service (SAAS) application designed exclusively for local government. 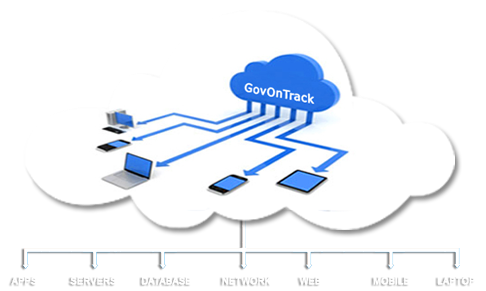 With over 25 years of experience in serving municipalities, the GovOnTrack Team continues its pioneering work with a tightly integrated, easy to implement and use set of software applications that reside entirely in the cloud. No more headaches in maintaining expensive local hardware and networks. Software delivered as a Service, with simple subscription pricing, and no long term commitments. We invite you to explore GovOnTrack NOW! All you need is Internet Access on either a laptop or a desktop computer (Mac, Windows or Android), a tablet or a smartphone.Say yes today.... all you need is the willingness to change to reduce clutter, headaches, hardware, software and reduce your cost of operations. Sign up now for a no obligation, full featured, fully functional trial. - You will love being a member of the GovOnTrack phenomena. © Copyright, GovOnTrack, All Rights Reserved.